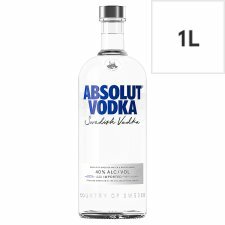 Absolut Vodka is one of the most famous vodkas in the world. The main ingredients in Absolut Vodka are water and winter wheat grown in the fields of Åhus, Sweden. The water comes from a deep well in Åhus where it's protected from impurities. With its refined nature and no added sugar, Absolut vodka blends perfectly with other aromas, enhancing the taste of your drinks. 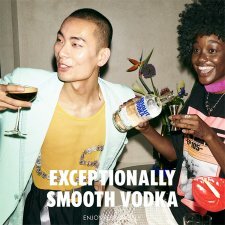 Serving suggestion: simply pour over ice, add soda and garnish with lime or use in any of your favourite vodka cocktails. Try it in an Eldeflower Collins or an Espresso Martini. Fill a shaker with ice cubes. Add all ingredients. Shake and strain into a cocktail glass. Garnish with coffee beans. Absolut Vodka has completely redefined the premium vodka landscape, becoming synonymous with art, culture and nightlife. 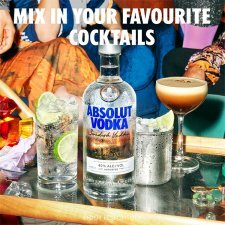 By starting a revolution in cocktail creation and launching a range of flavours never before seen on the market, Absolut has become an icon in its own right. It has been produced at the famous old distilleries near Ahus in accordance with more than 400 years of Swedish tradition. In 1879, Lars Olsson Smith, its founder, introduced the continuous distillation with which he made Absolut. Instead of the usual three or four times, the vodka was distilled an infinite number of times. At Absolut, not only do we source all the ingredients locally, we have also made our distillery one of the most energy-efficient in the world. Today, Absolut has a CO2 neutral distillation.